The Lights Suites are right next door to Malaga´s bustling Central Market, with many of the rooms having balconies overlooking the market. Each room has very comfortable beds, brand new ensuite bathrooms, air conditioning and large Flat screen TV´s. There is no better place to enjoy Malaga than at our completely brand new “The Lights Suites”. 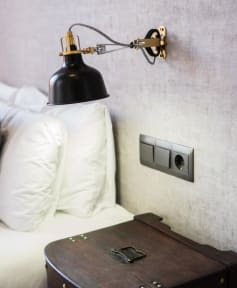 Each room is made to ensure you have an amazingly comfortable stay in Europe´s warmest city with 320 days of sunshine. Malaga is an amazing city, with so much to see and do. In fact it is quite unlike the rest of the Costa del Sol as it has completely retained its historical sites and architecture and has many winding lanes to explore the countless boutiques, restaurants, cafes and bars. There is a modern waterfront port and beaches. 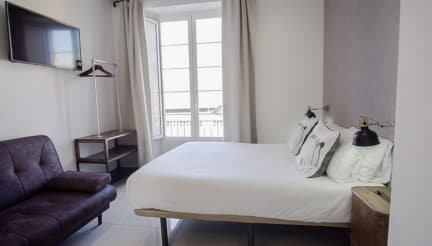 The suites are located right in the centre of Malaga, walking distance to every possible site in the city and only a 300 metres from the Alameda Central Train station. Several tourist landmarks such as the Cathedral, Paseo de Espana and Palacete de los Condes de are some minutes away walking from our facilities. We offer different types of accommodation oriented to different types of guests. We are specialized in private accommodation for a different number of people, always taking care of their needs and their wishes with the goal of making the stay of the guests something special. Breakfast not included - 1.50 EUR per person per day. The reception is open 24 hours per day in our building located in C/Torregorda 3. A booking for six people or more must be communicated in advance. Please contact us before if you and we will try to put you in the same room. We reserve the right to cancel any group booking that is made without contacting us beforehand or reservations made up of smaller reservations that add up to a group booking (i.e. 3 reservations of 4 people = 12). No smoking indoors or the balconies, but we do have an awesome roof terrace for you to go to. Wij verbleven 2 nachten (op de heen en terugreis voor een rondreis in Spanje) in een 3-p suite. Super schoon en modern en centraal gelegen in het centrum, tegenover de markthal. Daardoor wel wat verkeer lawaai in de vroege morgen, maar dat is logisch midden in een stad. Ontbijt heel eenvoudig, geen kaas en vleeswaren, maar daar is de prijs ook naar. Ik zou de volgende keer weer voor hetzelfde hostel kiezen.